Nirvana Cinemas, that’s riding high after the success of Mahanati is coming up with an other breezy romantic entertainer “Sammohanam” written and directed by National Award winning filmmaker Indraganti Mohan Krishna, who delivered many hits like Ashta Chamma, Gentleman and many more. Sammohanam starring Sudheer Babu & Aditi Rao Hydari has been making waves in social media for the teaser and amazingly rich visuals in it. The chemistry between Sudheer Babu & Aditi Rao was most talked about after watching the teaser and Indraganti’s mark is written all over the teaser. The movie also has the likes of Rahul Ramakrishna, Naresh, Tanikella Bharani and many other prominent people. Music is composed by Vivek Sagar, Pelli Choopulu fame and movie is bankrolled by Sivalenka Krishna Prasad under his banner Sri Devi Movies. We would like to thank Sivalenka Krishna Prasad Garu, Indraganti Mohan Krishna Garu and Sudheer Babu Garu for giving us this oppurtunity. Movie is set to hit the screens on June 15th with US Premieres on June 14th. 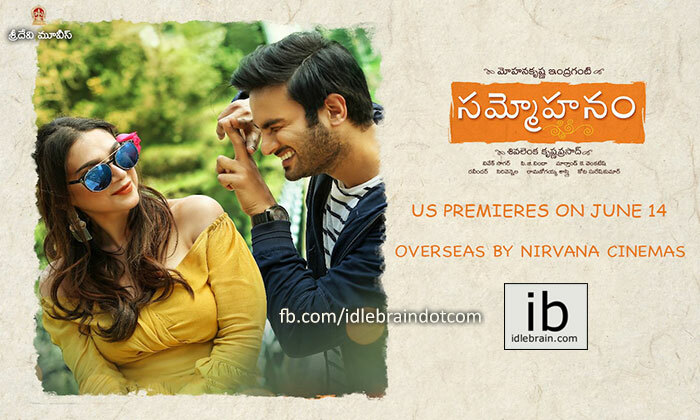 Sudheer Babu will be in USA starting next week to promote the movie and we will be visiting all major cities. We will be arranging Meet & Greet in all these cities and stay tuned for more details about the cities, venue & timings.